with full rounded ovoid body raised on gently curved and slightly splayed blade-shaped legs of triangular section ending in pointed feet, decorated on the shoulder with a narrow intaglio-cast band of elongated taotie motifs dissolved into 'C'-scrolls between borders of detached rings cast in thread relief, above a straight tubular spout rising at an acute angle, set opposite the rounded handle issuing from a bovine mask with horns curved back on top of a thick slab surmounted by a small loop to receive a chain for the cover now missing, the wide mouth with flaring rim and squared edge, a three-character pictogram cast under the handle, the surface with mottled green patination lightly encrusted overall. The pictogram under the handle may be read as X fu yi. The first character is probably a clan sign. 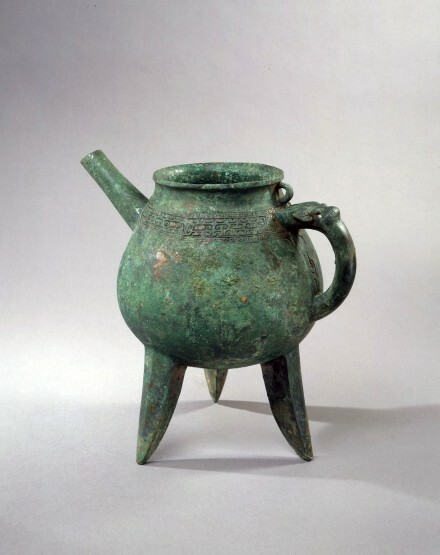 Compare the bronze he of similar form with a band of taotie motif on the shoulder, excavated near Baoji area and illustrated in Shaanxi chutu Shang Zhou Qingtongqi (Shang and Zhou Bronzes unearthed in Shaanxi province), Vol. III, Beijing, 1980, p. 160, no. 158, with description on p. 25. Compare also the he of similar form decorated with three raised 'bowstring' bands on the shoulders, in the Staatliches Museum für Völkerkunde, Munich, exhibited at the Asia Society and illustrated by Loehr in Ritual Vessels of Bronze Age China, New York, 1968, p. 39, no. 11. A smaller he of related form with a cover in the Metropolitan Museum of Art is illustrated by Young in the catalogue of the China Institute exhibition entitled Art Styles of Ancient Shang, New York, 1967, no. 10.